After Tuesday afternoon’s thundershowers, we woke to drizzle on Wednesday morning. I started making alternative plans, but the Task Committee committed. We were heading to the Paeroas for an expected late start. It was an obvious late start, by the time we arrived & sat on launch three clouds deep. But as the old saying goes, the Paeroas is ALWAYS on. The cloud lifted, and the task was set with a bit of a ridge run, then popping over down to Broadlands and back up to the SH5 / Settlers Rd intersection. There were some disappointing bombouts, but the day got better & better. Those who got away were rewarded with long smooth flights in a blue sky with plenty of fluffy clouds. Russell Read was first in goal by a massive 14 minutes. Well done, boy, that’s some speed! The following day we were lucky with a perfect Kaimais forecast. Actually it looked like it might be on the strong side, but hey, strong is normal for the Kaimais. In any case, it turned into a perfect Kaimais day. The task was an out & return up to W06 Tangitu Ridge, then back down to the SH29 / Tauranga Rd intersection for End of Speed and (1km further) Goal. 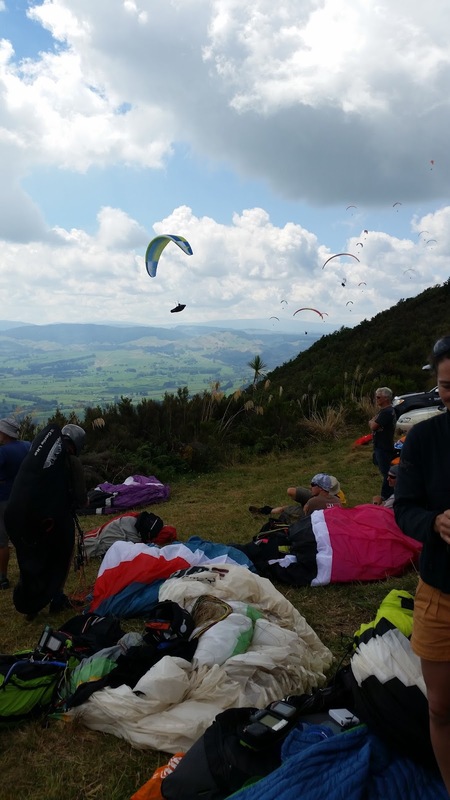 Pilots were choosing between following the ridge or pushing out to the flats – both working well, but a fair bit windier up the back, making it tough to push at times. There were a couple of landings in the forestry blocks along the range, which made for awkward & uncomfortable walkouts. Louis Tapper was first in goal, and made a killing on lead-out points. He was (not-so) closely followed by another 50 pilots(!) into goal. The farmer was more than a little surprised to see so many wings dropping out of the sky into his paddock. So were we, to be fair. Goal Cherries were popping all over the place. Sadly some arrived too low or forgot that Goal was another 1km past the End of Speed section. Only a rookie would make a mistake like that, right? …Right?